“A non-re-authorisation of the substance would be a disaster for the industry”, reads a note from a a March 2016 meeting between pesticide industry lobbyists from the European Crop Protection Association (ECPA) and members of Agriculture Commissioner Phil Hogan’s cabinet. The “substance” in question? Glyphosate, the active ingredient in Roundup, the world's most widely-used pesticide and Monsanto's flagship product. True enough, a European Union ban on this key ingredient in many weedkillers would be a major blow to the biotech and pesticide industry, its shareholders and its future owner Bayer. Since the World Health Organisation's International Agency For Research On Cancer (IARC) declared glyphosate a probable human carcinogen in 2015, the decision as to whether this weedkiller deserves another license for the EU market has been closely scrutinised. In addition, lawsuits against Monsanto in the US regarding Roundup’s health effects have enabled the release of internal company documents, which show how the company ghostwrote studies signed by ‘independent’ experts and tried to underplay data indicating health damage. The heightened scrutiny has also finally brought wider attention to some of the fundamental flaws in the EU's pesticide approval system – precisely what the pesticide industry and government agencies have been fearing, as highlighted by lobby documents obtained by Corporate Europe Observatory. They seem to regard an evolution of the EU regulatory system for assessing pesticides towards more independence and transparency (and better aligned with the normal scientific methodology itself) as an outright threat. For sustainable farming, public health and nature, a ban on glyphosate would be a leap forwards. On 23 October 2017 a coalition of civil society organisations handed over more than one million signatures to Vice-President of the European Commission Frans Timmermans and Health Commissioner Vytenis Andriukaitis, which had been collected from across the EU as part of a European Citizens’ Initiative. The demands: a ban on glyphosate-based weedkillers, crucial improvements to EU pesticide approval system, and support for farmers to transition to a non-toxic food production system. On 25 October however, EU member states are voting on a proposal by the European Commission to give the weedkiller a license for another ten years with few restrictions. The temporary 18-month license extension, granted in June 2016, will expire by the end of this year, forcing a decision. But member states are divided and the Commission is not expected to gather enough support for its proposal. Read more about how the pesticide industry and European Commission instrumentalised farmers’ lobbies to support their interests and proposals. Check the facts on Monsanto and the smear campaign of the wider pesticide industry against leading environmental health and carcinogenity expert, Dr Christopher Portier, and the International Agency for Research on Cancer (IARC). When the Glyphosate Task Force, led by Monsanto, learned that the Commission in June 2016 only wanted an 18-month extension of the license for glyphosate in order to await another opinion from the European Chemicals Agency ECHA, it labeled this a “dangerous precedent” and “a marked departure from science-based decision making”, ramping up the attack by calling the move “highly irresponsible and fundamentally irrational”. A “special interest campaign” targeting “modern technology”? In reality, what triggered the glyphosate issue is the fact that a highly respected scientific institution (IARC) concluded that an old pesticide from the seventies is a probable human carcinogen. Pro-glyphosate advertisement in Politico, 19 Oct 2017. 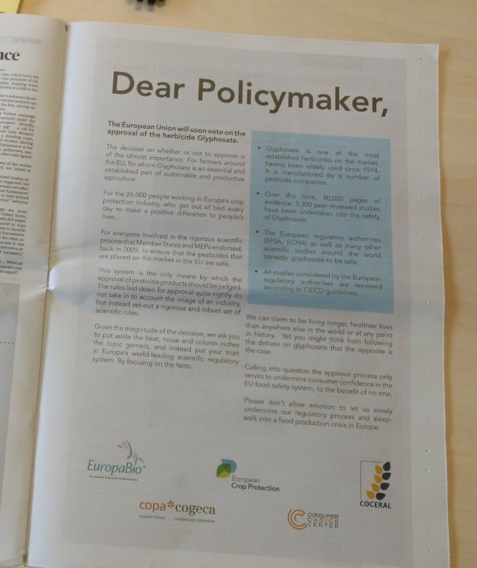 Interestingly, this ad was co-signed not only by the usual suspects, including EuropaBio, COPA-COGECA and grain traders’ lobby COCERAL, but also by a group called Consumer Choice Center (CCC). As Corporate Europe Observatory revealed recently, this grouping claims to represent consumers while it counts neoliberal US plutocrats and oil industry influencers the Koch Brothers among its main funders. Four of the scientists who were involved in the IARC assessment had a meeting with Commissioner Andriukaitis on 22 January 2016. Several flaws in the EU system were discussed, such as conflicts of interest, and the way that the EU pesticide approvals process focuses on one active ingredient, whereas the final mixtures (formulations) sold in the shops remain under-researched. The minutes do not further illuminate on the rationale for his argument. The EU pesticide legislation demands that pesticides that are for instance carcinogenic, toxic for the reproductive system, or hormone disrupting, to be banned; but other substances, even though toxic and harmful for many life forms, are not affected. In this meeting Andreas Hensel also emphasised to the Commissioner alleged “disagreements inside WHO (IARC vs JMPR), which should be more highlighted in communication”. This alleged internal “disagreement” inside the WHO – widely picked up in media last year and which continues to create confusion – is entirely false (see Box). Though true that another panel (Joint FAO/WHO Meeting on Pesticide Residues, JMPR) connected to the WHO made an opinion related to glyphosate, it was of a very different kind than IARC (studying risks of exposure through diet, rather than its intrinsic hazardous properties). In addition, the person leading the JMPR work is also the Vice-President of ILSI Europe, an agribusiness and food lobby group. German BfR head Hensel is a strong defender of the current EU system that he told the Commissioner is “most robust”. In the past he has breezily dismissed concerns over conflicts of interests, defending the fact that the pesticide committee of his agency Bfr includes Bayer and BASF employees (something that, in contrast, EFSA’s rules on conflicts of interest would not allow), explaining to German newspaper TAZ that facts about products “can only be judged by those that work with them”. Some of the named experts, such as David Kirkland, have stated that Monsanto employees were being “naïve” when suggesting in internal emails they would be able to have him sign off on documents in fact produced internally by Monsanto – a defence Mr Kirkland brought up at the European Parliament hearing on the Monsanto Papers. Even if this were to hold true, Monsanto doesn’t come off looking much better. Who says their ghostwriting attempts were limited to the cases we now have information about? Another key figure named in the Monsanto Papers, the US Environment Protection Agency’s (EPA) Jess Rowland, has in the meantime become subject of an investigation by the EPA’s Inspector General. If this week’s vote indeed fails to produce a majority for the EU Commission’s 10-year proposal, the EU institutions will need a plan B. If they opt for a phase-out of Roundup, it is vital to clarify that any re-authorisation only represents a transition period that will end in a ban of the substance. The glyphosate saga has also underlined the dire need to fundamentally strengthen the EU approval system and has shown just how important it is to provide all necessary support to farmers to help them make the transition to a pesticide-free agriculture. All of these demands are at the core of the European Citizens’ Initiative StopGlyphosate, which has been supported by over 1,3 million EU citizens from across Europe and was handed over to the European Commission on 23 October. On 24 October the European Parliament voted a resolution making similar demands. And on 12 October, the French tribunal of Foix sent four prejudicial questions to the European Court of Justice, that also question the reliability of the current EU pesticide risk assessment. The need to change the way pesticides are approved can no longer be ignored. Box: Internal disagreement inside the World Health Organization? Not really. In 2011 the Joint WHO/FAO Meeting on Pesticide Residues (JMPR) concluded that exposure to glyphosate through the diet was not likely to cause cancer in humans. IARC on the other hand did something else: a hazard assessment, to judge whether glyphosate as such has carcinogenic properties. Pesticides with a carcinogenic hazard should be forbidden in the EU based on pesticide regulation 1107/2009. Again in May 2016, the JMPR published a similar conclusion. The work was led by Professor Alan Boobis from the UK Imperial College, who is also Vice-President of the International Life Sciences Institute (ILSI) Europe. ILSI is a lobby group with offices around the world, led and financed by many chemical and food multinationals, from Monsanto, to Coca Cola, to MacDonald’s. Just a few days after the May 2016 JMPR meeting, Monsanto wrote on behalf of the Glyphosate Task Force (an association of pesticides and chemical companies that Monsanto spearheads) to DG SANTE about the committee's findings. Despite the fact that Professor Boobis’ conflicting interests were noticed by various European media, the myth of “internal disagreement in the WHO over glyphosate” – so helpful to the pesticides lobby – keeps being echoed today. For example, just one day before the recent Monsanto Papers hearing in the European Parliament, ECPA lobbyist Graeme Taylor wrote to MEPs claiming that “regulatory authorities around the world, EFSA, ECHA, and the WHO all consider glyphosate to be safe” (emphasis added).